The inspiration for this dish comes from the Middle East – dukkah-marinated chicken with lentils and roasted vegetables. Dukkah is an Egyptian seed, nut and spice mix. I am using sesame seeds, pistachio nuts, coriander seeds, cumin seeds and chilli flakes in my take on this mix. Like with all spice mixes, the ingredients vary from one recipe to another. 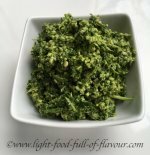 You can buy ready-made dukkah dips but it is so easy to make yourself – and I feel it is so much more satisfactory, and fun, when you have made it yourself. Seeds and nuts are full of essential fats, vitamins and minerals. The best way to absorb all these healthy nutrients in seeds and nuts is to eat them crushed up – and this seed, nut and spice mix is pounded in a pestle and mortar until you have a dry, finely ground mixture. 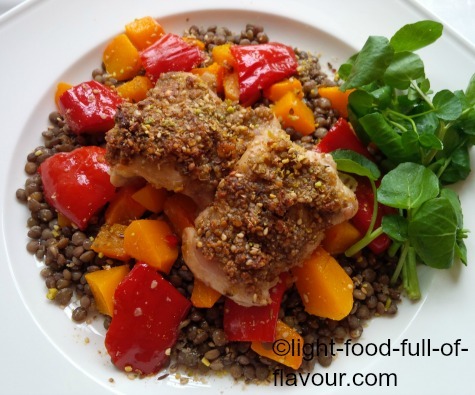 I am using Puy lentils – they are my favourite type of lentils. If you can’t get hold of these lentils, you can swap them for green lentils. To top off this dish, I add some delicious crumbled feta cheese before serving. I was on a dairy-free diet for quite some time but I now eat feta cheese made from goat and sheep milk every now and then. This will make a bit more dukkah than you need for the marinade but it will keep for a month if you store it in an air-tight container. The way this mix is often eaten is by dipping flatbread first in olive oil and then in dukkah. 1. Pre-heat the oven to 200C/fan 180C/400F/gas mark 6. Start by dry-roasting all the ingredients for the dukkah in a frying pan for about 2 minutes – stirring continuously - until they start to colour and release an aroma. Place the ingredients in a pestle and mortar and grind until you have a fine mixture. 2. Mix together all the ingredients for the marinade. Cover an oven tray with baking parchment and place the chicken thighs flat on the tray. Smother the chicken with the marinade. 3. Toss the diced squash and pepper chucks with 1 tablespoon of olive oil and a good pinch of sea salt in a roasting tin and roast in the oven for 25-30 minutes. 4. As soon as the vegetables are in the oven, cook the Puy lentils according to pack instructions. I cook the lentils in vegetable stock for approximately 22 minutes before draining them. 5. While the lentils are cooking, place the tray with chicken thighs in the oven as well and cook for about 20 minutes - until the chicken is cooked through. Once everything is cooked, mix the roasted vegetables with the Puy lentils and divide between four plates. Top each plate with two dukkah-marinated chicken thighs and crumble over some feta cheese. Serve together with green leaves. New Comments! Have your say about what you just read! Leave me a comment in the box below. Delicious Sri Lankan vegetable curry which is quick to cook once you have prepared the ingredients. Easy to make and delicious vegan banana pancakes with cinnamon and coconut. It's all about a healthy gut these days - how to increase the amount of healthy bacteria in our bodies, how to keep these little miracle workers happy and why they are so important to us. Copyright © 2012-2019 www.light-food-full-of-flavour.com. All rights reserved.